Mac & cheese is one of my all-time favorite comfort foods. I was a big fan of the boxed variety when I was a kid (the kind that came with a can of “real” cheese sauce, not the powdered cheese stuff, of course). And my mom was a big fan because it was a quick, easy meal that the whole family liked. But when I was finally wise enough to look at the nutrition label on those boxes, I was stunned at all the fat and sodium (and don’t forget all those unpronounceable ingredients). Not only is this ultra-creamy version of mac-and-cheese nearly as fast as the boxed variety, but your family will be able to pronounce every ingredient. Even my mom can get on board with that! When I have some extra time, I like to cook Baked Mac & Cheese. Whenever I make it, I whip up a double batch to freeze for a practically instant dinner on a busy night. And there’s a layer of spinach in there, which is delicious and nutritious! Hate spinach or just prefer your mac & cheese unadorned? 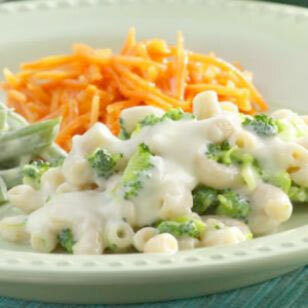 Try our plain-Jane veggie-free baked Macaroni & Cheese. Or if you want to really get fancy, go for Cheesy Chicken Pasta, an ooey-gooey crowd-pleasing pasta dish that's like rich and creamy macaroni-and-cheese tossed with cauliflower and chicken. If mac & cheese is just one of the reasons you love pasta, here are 22 other ways to dress up a box of pasta.